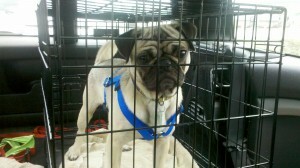 My name is Pugsly and I was adopted even before I made the website! Yeah!!! Update from his Furever home: He goes by the name of Farley now and has adjusted very well to it! He has gotten very comfortable in his new home as he is quite the explorer! He likes ice cubes, his green plush toy (we call it green meanie), and has enjoyed getting to know his “Uncle Frankie”, my mom’s 9 yr old pug! He is such a sweet little guy and he has so much energy, yet is SO well behaved! He is adorable and anyone who names a toy green meanie sounds like fun people! I had to post b/c my pug Pip has an Uncle Frank as well! He is a yorkie though but they love each other and play and play and play!!! Just wanted to share!